The London Taxi is heading down under, thanks to a deal struck with authorities in Perth, Western Australia. A test sample of 98 white used factory demonstrator 'hot-climate' TX4s have been shipped to Australia, as part of a trial to test the iconic vehicle there, with a view to a further 200 being shipped out in 2014. 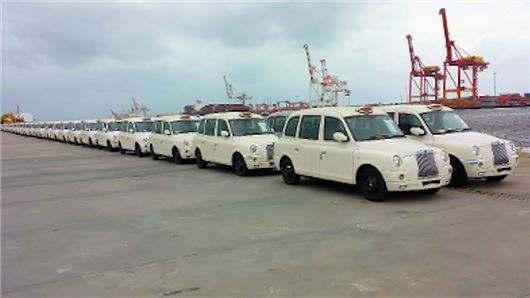 The cabs, which form the first large export order for the recently renamed London Taxi Company, will be taking to the streets in Perth within the next few weeks. As well as performing vital hot weather testing for the Coventry-based Taxi company, which is now fully-owned by the Chinese car company Geely, and which saw production restart recently, the taxis are in Perth to alleviate the current shortage of cabs. With the additional Australian order for 200 new vehicles Evan also confirmed that the State of Victoria may well be the next destination to welcome the global icon in 2014. 'When you have a look at the majority of current existing taxis, they are converted sedans which were not built to be cabs and therefore they are simply not fit for the purpose. The beauty of the London Taxi TX4 is that it is the only global vehicle built to be as a cab, so we anticipate that they will be a lot of demand for it across Australia,' Evan added. Western Australian Government Transport Minister Troy Buswell said the trial was part of his Taxi Action Plan which aimed to improve the security, standards and availability of Perth taxis, and that the purpose-built taxis were designed and manufactured specifically to improve safety, comfort and accessibility.